So I've got a little money saving tip for everyone. I just recently thought of this and it's been working great. I'm not a huge fan of can fruits, but I do seem to use a lot of can pineapple with my recipes. I'm always frustrated when I have to drain the juice. It seems like such a waist. I will usually try to keep it, thinking there must be something useful I can do with it. Well I've finally come up with a few good ideas. 1. Freeze juice into popsicles. My daughter has recently found the joy of a yummy popsicles. In order to make them a little more healthy, I will make homemade popsicles. The juice from can fruits is perfect. Sometimes I will water down the juice a bit and add some cut up fruit for more nutrition. 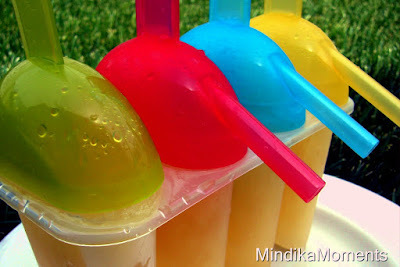 The popsicles below are made from left over pineapple juice with a little pear juice added. I bought the popsicle molds for $1.99 at Walmart. 2. Any recipe that calls for juice. 3. Use instead of water in cake mixes to add a hint of flavor. 4. Add to any punch or mix drink for parties. If any of you have other idea's on how to use drained juice from can fruit, I'd love to hear them. love this idea, we usually just add the juices into smoothies. i can't get enough smoothies in the summer.